Amazing Grace and a Safe Haven: More Love Mama NEWS and GIVEAWAY! More Love Mama NEWS and GIVEAWAY! How would you like to win a $50 MORE LOVE MAMA store credit or a new MORE LOVE t-shirt??? Well, keep reading for more details on how to play! So I've been plugging away at my little homegrown business, MORE LOVE MAMA for almost a year now. I'm at about a break even point. I've managed to sell enough to pay for a better sewing machine. I'm building up inventory and I'm making contacts. I'm no where close to being able to quit my day job, but things are going well. For those of you that have asked for them, I have a new batch of MORE LOVE t-shirts They're a heather red with white print. Very eye-catching, super soft, and comfy. The design has been updated slightly and the quote is now on the back. If you like to wear a shirt that is a conversation starter, this is it. I wore mine on our trip to Disney World and probably got stopped and asked about it more than half a dozen times. I'll probably continue to add more colors and styles in the coming months if these turn out to popular enough. And things are changing...a little. I've started offering African Wax Print fabric for sale by the yard. I've found some wholesalers so I plan to start offering a larger stock of wax prints. I also hope to expand into more textiles in other styles and from other countries. For instance, a friend of mine just brought me back some gorgeous fabrics from her adoption trip to the Marshall Islands. Below is Grace in a lovely Marshall Islands scarf. So if any of you are planning trips to any interesting locales, let me know and you can bring me back a suitcase full of fabric. My favorite addition to the store are some new fabrics I found that just looked like my family. I know that sounds crazy but here are some pictures of what I mean. I found this print when I was browsing for fabric online and it sort of spoke to me. It said "Wow, these mermaids look like your babies!" There they were: a whole sea of mermaids that looked like Grace and Kat and Louise. And ballerinas. Fabulous brown and butterscotch ballerinas dancing in a field of pink. The more I looked, the more fabrics I found that seemed to celebrate kids like mine and animals that they love and colors that make them light up. So I've made up a bunch of new blankets with giraffes and pandas and elephants and zebras and lots of beautiful brown and yellow and pink faced kids that look a bit like mine. So I'm seeking "multicultural designs" and other prints that feel like my family and might appeal to you, too! 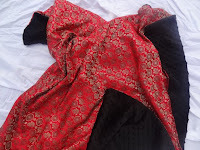 I've also added some Chinese brocade and minky blankets to add to the world textile mix. I'm also branching out into a few new projects. For instance, do you have a traditional dress you had made for yourself on a trip overseas and when you got it home you realized just how ridiculous you now look in this dress. Or did your trip to Congo cause you to lose (or parenthood stress has caused you to gain) 15 pounds and it no longer fits. Well, send that unfortunate fashion mistake to me and I will up-cycle it into something wonderful for you or your home. A minky blanket, a throw pillow. A scarf for you or a dress for one of your littles. Be creative and together we can preserve the memories instead of leaving them in the back of your closet. I am always up for a try at any custom order. In fact, just last week I got a request for a dashiki tunic shirt. So I drafted up a pattern and whipped up a couple of new designs for a traditional dashiki shirt and a dashiki dress that will be in the shop any day now. So start planning which fabrics you want yours made from :) Here are two I made for my adorable models! Finally, for any of you local folks, I will be offering sewing lessons starting in September. They will be $25 per hour, you don't have to have your own machine yet, and you'll be guaranteed to leave with something to wear or use in your home! So to get you all as excited about all these big changes as I am and to encourage you to take a peak at my shop, my dear friend Megan at Millions of Miles is hosting a MORE LOVE MAMA giveaway. Megan is one of my favorite people in the whole world and definitely one of my all time favorite bloggers. If you haven't had a chance to read her stuff you are missing out. So take a trip over to Millions of Miles. You can enter the contest on her blog or here on mine. It's super easy to enter using the widget below. Megan will pick a winner next week!